Blood and urine tests play vital roles in modern medicine. Yet in vast regions of the world where refrigeration is not available, preserving samples for testing is virtually impossible. Now in a study appearing in ACS' journal Chemistry of Materials, scientists report that encapsulating indicators of disease from samples in tiny metal-organic hybrid structures could help. They say finding could lead to better health care in resource-limited countries. 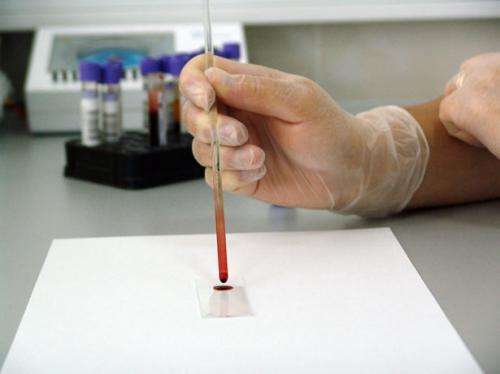 Clinical labs conduct more than 7 billion laboratory tests—many of them involving blood and urine—in the U.S. each year, according to the American Clinical Laboratory Association. However, without refrigeration, these samples degrade quickly and that can lead to testing errors. But in many parts of the world, refrigeration isn't available and, as a result, blood and urine testing isn't practical. Preservatives such as boric acid are only good for short-term storage, and dried blood samples are still difficult to implement in resource-limited areas and can result in aggregation. Metal-organic frameworks (MOFs) are porous structures that can encapsulate and protect molecules, and in previous research, Srikanth Singamaneni and colleagues showed that MOFs can preserve proteins in biosensors. So, the team sought to overcome the challenges of sample degradation with MOFs. The researchers mixed MOF precursors into blood and urine samples from healthy volunteers that had been "spiked" with biological markers for ovarian cancer and acute kidney damage, respectively, and then air-dried the samples. The samples were stored in temperatures ranging from 77 to 140 degrees Fahrenheit for up to four weeks. The researchers found that after one week, urine markers encapsulated with MOFs that were stored at temperatures up to 104 degrees retained more than 85 percent of the biomarker for kidney damage compared to samples without MOFs, which retained less than 40 percent. Similar results were obtained with treated and untreated blood samples stored for four weeks. The researchers say that this technique was as effective at preserving biomarkers as refrigeration. They conclude that using MOF-based structures in conjunction with dry spot collection techniques could lead to better diagnoses and medical care in underserved nations.